Background: Left ventricular dysfunction after ST segment elevation myocardial infarction (STEMI) is the most important factor affecting morbidity and mortality. The primary objective of reperfusion therapy is to restore epicardial flow and to reperfuse the myocardial tissue. However, in some cases lack of microvascular reperfusion and, consequently, significant left ventricular (LV) dysfunction persist despite the rapid and sustained restoration of blood flow. Early in the course of STEMI, therapies that may harm patients who develop LV dysfunction, such as beta-blockers, are often administered. Aim of the work: construct a predictive score of the risk of developing left ventricular dysfunction in patients with STEMI. 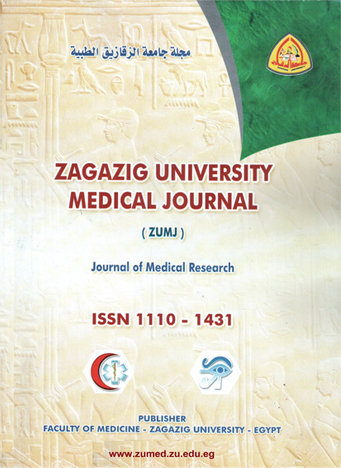 Patient and methods: This study was done in Cardiology department, Zagazig University on 100 patients; 78 males (78%) & 22 females (22%) with first acute STEMI underwent successful primary percutaneous intervention (pPCI). Within 72 hours of admission, all of the following parameters were reported: risk factors, blood pressure, heart rate, KILLIP class, need for mechanical ventilation (MV), cardiac enzymes, admission blood sugar, kidney function, lipid profile, electrocardiographic data (ST elevation in millimeters (mm), location of infarction, ST resolution, QRS width in milliseconds (ms), Selvester score), echocardiography (ejection fraction by Simpson's method, wall motion score index) and angiographic data (culprit artery, Total number of diseased vessels, severity of coronary artery disease, Gensini score and door to balloon time). Results: LV dysfunction was associated with decreased renal function (creatinine >1.1 mg/dl, p= 0.029), number of diseased vessels >2 (p=0.034), absence of complete ST segment resolution (p< 0.001), wall motion score index > 2.05 (p=0.008), sum of ST segment elevation >13.5 mm (p<0.001), QRS width >98.5 ms (p<0.001), Selvester score >3.5 (p<0.001) Gensini score >95 (p<0.001), anterior location of infarction (p =0.002) and KILLIP class >1 (p=0.003). A prediction score using these variables stratified patients into low, intermediate and high-risk groups for LV dysfunction; positive likelihood ratios for LV dysfunction in these groups were 2.9, 2.1, and 2.4, respectively. Conclusions: 10 key predictors of in-hospital LV dysfunction after STEMI were identified; a risk score based on these predictors helps to quickly identify patients presenting with STEMI who are at the highest risk for developing significant LV dysfunction and could guide optimal therapeutic choices.